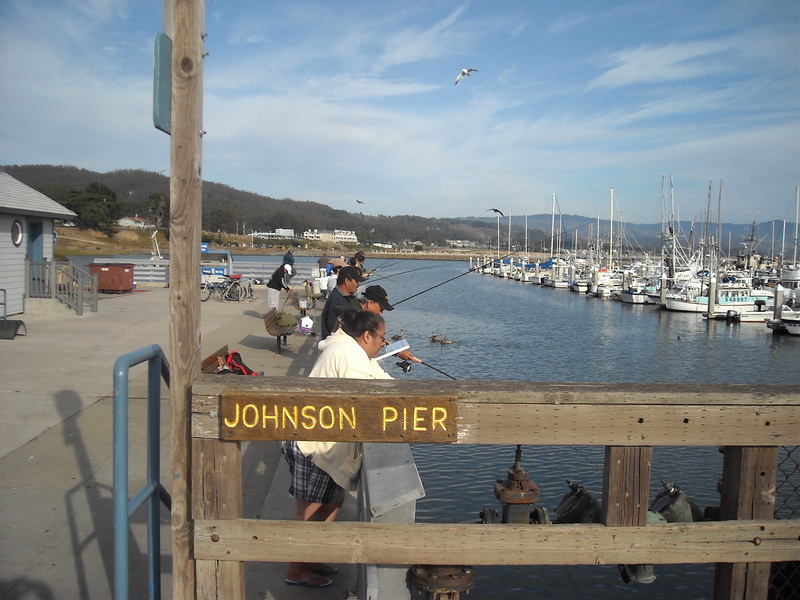 The 840-foot-long Johnson Pier is the pier associated in most people’s minds when Half Moon Bay and Pillar Point Harbor are mentioned. From this inner harbor pier, anglers can catch Sportfishing boats, observe commercial fishermen, and even fish a little themselves. The pier was named for the congressman who helped to raise money for the harbor project. Environment. 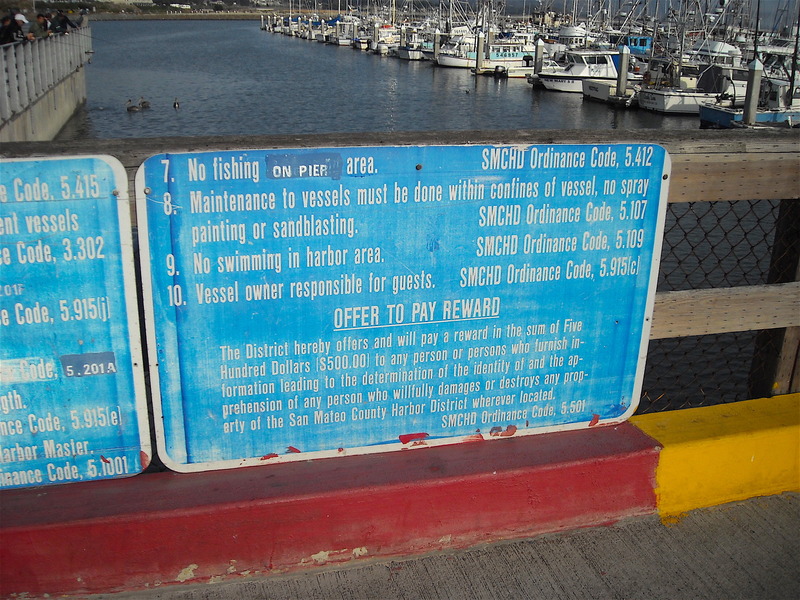 Fishing is restricted to the area adjacent to the entryway onto the pier. 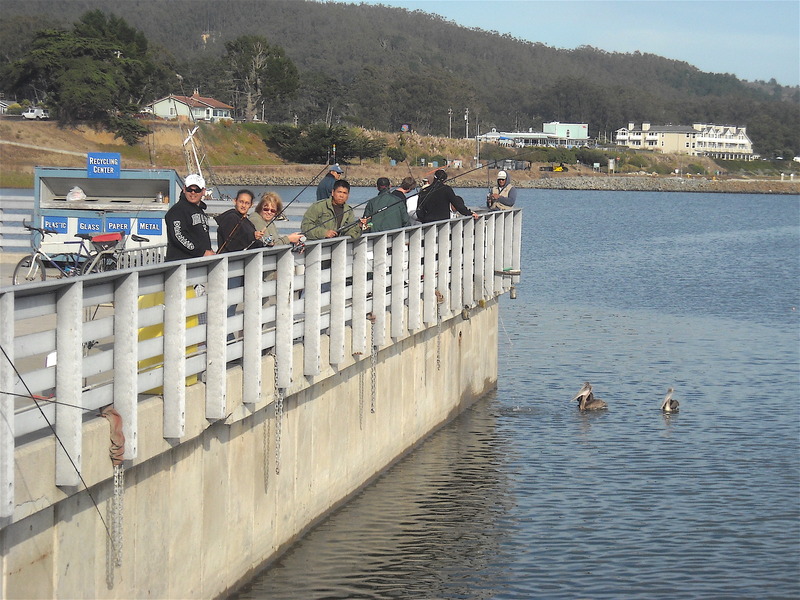 A concrete wall acts as a shoreline running perpendicular to the pier and railings and benches are placed atop the concrete for spectators and anglers. Fishermen are presented an open waterway, probably fifty feet in width, between the shoreline and the first set of boats. Water depth is fairly shallow, the bottom is primarily mud, and anglers are presented a limited number of fish. Most commonly caught fish continue to be white croaker, perch, an occasional flatfish such as starry flounder or sanddab, a few jacksmelt and even a few rockfish. Fishing Tips. The main rigging used here is a high/low leader with size 4 hooks and baited with pile worms (for perch) or cut bait (for white croakers and flatfish). At times you may see what appears to be movement in the water. This is often schools of jacksmelt or other small fish such as anchovies, topsmelt, herring or sardines. When this happens try a multi-hook snag rigging like a Lucky-Lura. Cast out and give your line a slow retrieve. If that doesn’t work, bait a few of the small hooks with pieces of pile worms and use a bobber or float to keep the hooks just under the surface of the water. This will get the larger jacksmelt. 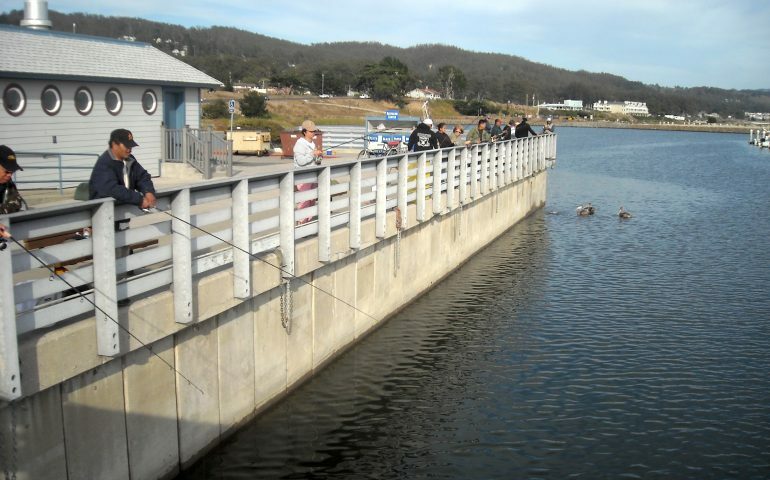 Although this water is more restricted than that at the nearby Pillar Point Pier, anglers can fish all night. So, this can be a spot to try for sharks and rays when the smaller pier is closed. Facilities: There are lights on the Johnson Pier and adjacent to the pier are restrooms, restaurants, snack bars and a bait shop (Cap’t Johns) that is generally open from 5 A.M. to 5 P.M. There is also considerable free parking near the entrance to the pier. Handicapped Facilities: Handicapped parking and restrooms. Not posted for handicapped. How To Get There: From Highway 1 simply take the Pillar Point Harbor turnoff and follow the road to the pier. Management: Pillar Point Harbor District. 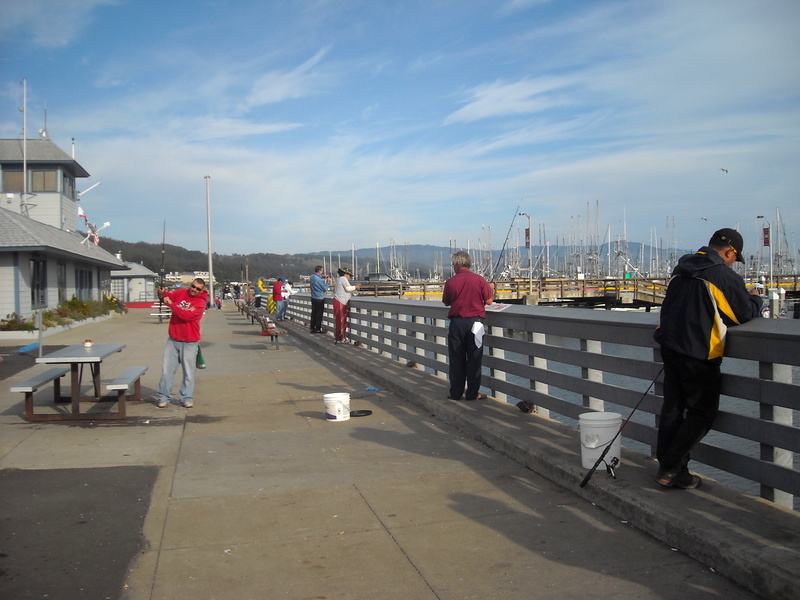 Can I catch Dungeness or Rock Crabs from Johnson pier or Pillar Point Pier? What can I use? Crab Snare, Hoop Net or Crab Trap/Pot? What kind of fish can I catch this time of year at the Piers?